Welcome to the poetry section of our website ! 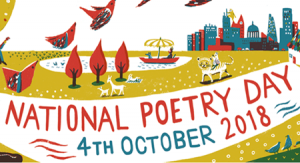 National Poetry Day will take place on Thursday 4th October and this year’s theme is “Change”. Award-winning Grace Nichols creates all the moods evoked by the title in this beautiful anthology. In poems such as ‘Sun, You’re a Star’, Nichols gives her own account of the universe. In a sequence of poems about the seasons, including ‘Sir Autumn’ and ‘Lady Winter’s Rap’, Nichols paints the world freshly for her readers. Every poem is a delight in itself – while together they give readers a newly painted world. ‘Cosmic Disco’ was published in 2013 and is illustrated by Caroline Binch. in the ocean of a vast celestial bubble. Roger McGough taught at St.Kevin’s Comp in Kirby and was a lecturer at Mabel Fletcher College. He presents ‘Poetry Please’ on BBC Radio 4. This collection has over 50 poems. From pies to pandas, from school to scarecrows, this is a wonderfully funny and often thought-provoking collection. It’s full to bursting with sharply observed poems, rhymes and riddles. The collection was published in October of 2015 and includes many of the poet’s own line drawings. For age 7+. Fun Time, School Time & Home Time. The subjects will all be familiar to little children but the poetry makes them special. 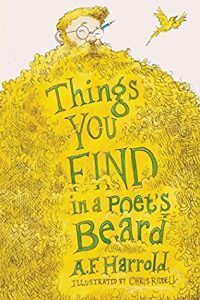 ‘Things You Find in a Poet’s Beard’ is a collection of poems that have been shouted at children from schools to church halls, silly tales that have been illustrated joyously by former Children’s Laureate, Chris Riddell – and bound into a book. Children might want to entertain the family by reading them out; perhaps they’ll want to chuckle at them under the covers with a torch; perhaps they’ll want to stare at the pictures drawn by Mr Chris Riddell – or maybe they’ll want to shout them aloud to capture the spirit of the poet, A.F. Harrold himself. A.F. Harrold is a poet who writes and performs for both adults and children. He has also written a number of children’s books, including the ‘Fizzlebert Stump’ series. How d’you fit a genie in a bottle ? How d’you fit a world inside a book ? How d’you fit the sun into the summer ? How d’you fit a mountain in one look ? How d’you fit an oak inside an acorn ? How d’you fit the wind under a kite ? How d’you fit your sweetheart in a locket ? How d’you fit the dark into the night ? Kate Wakeling’s first book of poems for children is full of curious characters and strange situations. The poems are always musical, sometimes magical, and full of wonder at the weirdness of the world. In this brilliant book, you’ll meet Skig, who’s meant to be a warrior – but is really more of a worrier. You’ll meet a giddy comet skidding across the sky with her tail on fire. And you’ll put a marvellous new machine in your pocket and maybe you’ll be able to fix all of life’s problems. The poems are illustrated by Elina Braslina. CLiPPA is the Centre for Literacy in Primary Poetry Award. 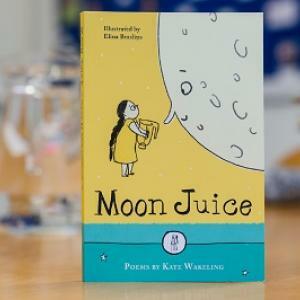 Kate Wakeling won the 2017 CLiPPA award for children’s poetry for ‘Moon Juice’ (her debut collection), published by independent publisher The Emma Press. its insides cooked up nice and pink. an itch tells you it’s on the brink. and I favour a filling of knee. this pie crust belongs just to me. 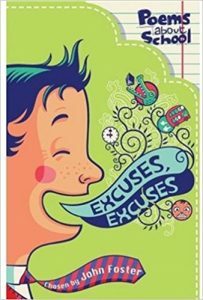 This is a favourite and best-selling collection of poems about school, compiled by John Foster. Most the poems here are humorous, but some are more serious and will make you think. 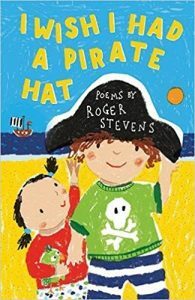 Many of them have been written specially for this collection and, together with other poems by such well-known children’s poets as Michael Rosen, Kit Wright, and Spike Milligan, go to make up a lively and engaging anthology. Published in 2009 and for age 9+. A noun is a naming word. ‘He named the ship Lusitania’ ? ‘I like doing homework’ ? ‘Describing sunsets is boring’ ? I know it is, said George. What do you mean you don’t like poetry ? 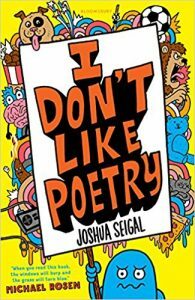 This must mean you’ve not read the debut collection of poems from Joshua Seigal ! 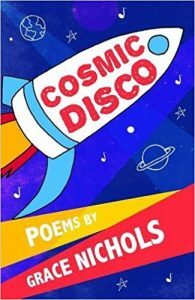 Whether it’s poems about the power of books or the joys of fried chicken, once you’ve read Joshua’s poems you’ll be shouting from the rooftops that poetry is the place to be! 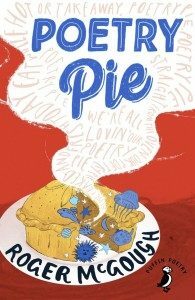 Packed with subversive humour and a real insight into the world of children today, I Don’t Like Poetry will please the most reluctant of poem readers – whether they want something funny, sad or scary. It is a wonderful collection that shows a new poet at his best. Published on 8/9/16 and for age 7+. the day the poet came.